The NFLPA, which was not involved in negotiating the NFL's new national-anthem policy, was not happy with what the NFL came up with. The NFL passed a new policy on Wednesday requiring players on the field to stand for the national anthem, while also giving them the option to remain in the locker room during the song. The policy is being hailed in some corners as a compromise, but in reality, there was no meeting in the middle. 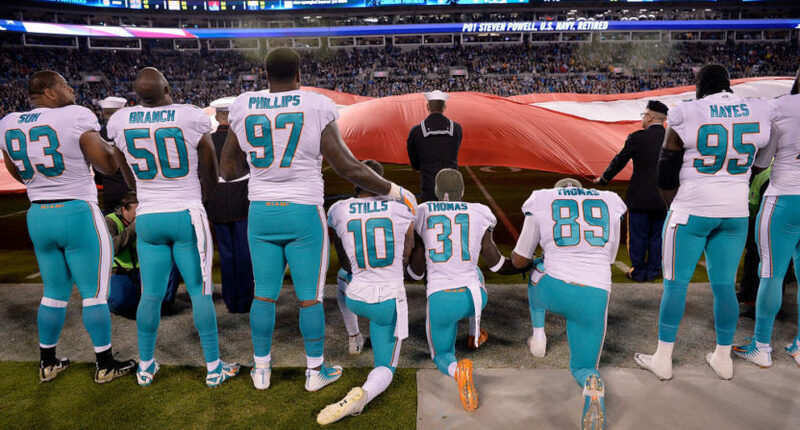 The NFL ended the protests, as they so desperately wanted, and the players got nothing. Protesters weren’t asking for the right to stay in the locker room. They were asking for the right to express their opposition to police brutality and other forms of racism that literally kill people. And they were rejected out of hand, without so much as a seat at the bargaining table. It’s no surprise, therefore, that the NFL Players Association is not a fan of the new policy. “The vote by NFL club CEOs today contradicts the statements made to our player leadership by Commissioner Roger Goodell and the Chairman of the NFL’s Management Council John Mara about the principles, values and patriotism of our League,” the union said in a statement, promising to challenge any aspect of the policy that is inconsistent with the CBA. Ultimately, the union has only so much power here. The league has set its policy (and invited individual teams to set their own policies), and players will have no choice but to abide by them. But what the union can do is yell and scream and make an un-ignorable fuss about the NFL’s hypocrisy, about its silly “respect the flag” rhetoric that pays zero mind to the real cause of players’ protests. In a statement released Wednesday, NFL commissioner Roger Goodell said it was “unfortunate that on-field protests created a false perception among many that NFL players were unpatriotic.” But instead of allowing players to express that patriotism in their chosen way, through protest, Goodell and the puppeteers who control him have chosen to enforce their own style of patriotism, in which people show reverence to a flag while silencing any attempt to raise awareness of problems that affect millions of people who live under that flag. Now that’s something worth protesting over.